We’d love your help. 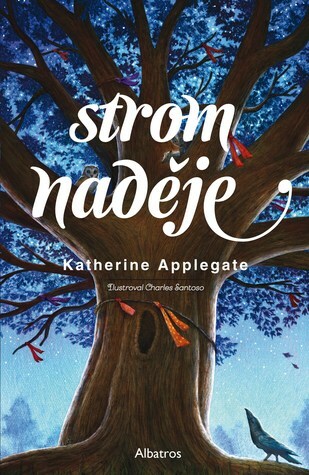 Let us know what’s wrong with this preview of Strom naděje by Katherine Applegate. To ask other readers questions about Strom naděje, please sign up. illustrations in color or black and white only? what reading level would this book be... my 3rd grader is loving reading this... some tricky words but we can't find the reading level "letter" on any of the sites I'd normally check - thanks in advance? A beautiful story and a poignant metaphor. Animals compete for resources, just like humans. They eat one another. They fight for dominance. Nature is not always pretty or fair or kind. But sometimes surprises happen. And Samar, every spring night, reminded me there is beauty in stillness and grace in acceptance. I cannot wait to give my copy of this book to a kid in need of a wonderful read. It is absolutely beautiful. It’s poetic without being pretentious and narrated by a tree older than any existing human. And yet, this tree is more humane than anyone I know. The tree is an observer. It philosophizes about life and shares his thoughts with his (not always) delightful animal tenants. It doesn’t act, because it cannot move like a human can. But the tree feels compelled to do something, or ‘‘say’’ someth I cannot wait to give my copy of this book to a kid in need of a wonderful read. But the tree feels compelled to do something, or ‘‘say’’ something rather, when a new family moves into one of the two houses in front of it and some people express their unhappiness about having Muslims for neighbors. It’s a deeply moving story about love, friendship and acceptance, as well as the importance of preserving nature that harms us in no way. Like one of the animals mentioned in the story, why would you kill something that literary gives you life – oxygen? Not only that, but this is a page-turner. It’s short but still full of substance. Plus it contains great illustrations that help visualize scenes and add to the lyrical atmosphere. A must buy, read, review. With Red, Katherine Applegate introduces another quiet, resilient protagonist who -- like the caged gorilla in “The One and Only Ivan,” -- speaks movingly to a noisy, belligerent world. Red is a caring oak who describes her life as a leafy shelter for generations of animals, and as a wishtree for humans. It’s easy to suspend disbelief with her wise voice, active mind and caring soul. She knows well the habits of creatures in her world and treats readers to an insightful analysis -- though the ha With Red, Katherine Applegate introduces another quiet, resilient protagonist who -- like the caged gorilla in “The One and Only Ivan,” -- speaks movingly to a noisy, belligerent world. Red is a caring oak who describes her life as a leafy shelter for generations of animals, and as a wishtree for humans. It’s easy to suspend disbelief with her wise voice, active mind and caring soul. She knows well the habits of creatures in her world and treats readers to an insightful analysis -- though the habits of humans could be a bit trickier for her. The pacing starts out slowly, with early chapters focused almost entirely on the natural world, but eventually we get to meet the human at the novel’s center. Samar, a recent Muslim refugee, is lonely and in need of a friend. When a teenager carves a hateful message into Red’s trunk, she worries about its effect on Samar and her family. Amidst all this, the woman who owns the property threatens to cut down Red, having forgotten the story of her ancestors and the beginning of all the wishes. As much as she doesn't want to be chopped down, Red still persists to help Samar. So she and her best buddy, a crow named Bongo, begin to scheme about helping Samar make a connection to the community, with poignant results. Applegate often untangles thorny subjects for young readers. In "Wishtree", she takes on anti-Muslim bigotry, handling the subject with a light touch, so the treatment doesn't feel heavy. There's sly humor, and fun friendships involving the tree, talking animals, and humans, mixed in with some meaty scientific information about trees and animals. The story is sprinkled with strikingly beautiful language, but never showy. My favorite was, "the stars freckled the sky." I adored Red! And her story could teach us a lot about kindness, friendship, family, heritage, and so much more. ALL THE STARS!!! This is THE middle grade book of fall 2017 and it should be on the pre-order list for every single library and middle grade classroom in the country. While it may be listed as for ages 10-14, I would read this book aloud as far down as first grade. WISHTREE is at first glance a middle grade novel about a tree and animals, but WISHTREE is also, and more importantly, a message book. It uses the medium of a beautiful middle grade story to spread a message about wishes and inclusion ALL THE STARS!!! This is THE middle grade book of fall 2017 and it should be on the pre-order list for every single library and middle grade classroom in the country. While it may be listed as for ages 10-14, I would read this book aloud as far down as first grade. It uses the medium of a beautiful middle grade story to spread a message about wishes and inclusion and friendship and religious tolerance in a time of great turmoil in the US. And yes, it also has great dialogue between Red the oak tree and Red's animal friends - that's what will first hook kids! But as teachers and parents share this book with children, Red and the animals will fall to the background as discussions about big topics arise.....big topics that we do need to be talking about. What Applegate has done with this book is exquisite, as she has wrapped this vital message up in a book that is incredibly accessible to to even the most reluctant middle grade reader - short chapters, simple sentences and manageable vocabulary are the perfect venue for a message like this. I will be recommending this as a staff book club pick this year and hope to have it read aloud to as many classes as possible in my school. It's THAT good. And THAT important. Please see the book website http://wishtreebook.com/ for resources and to register for a Wishing Day event on 9/28/17. Five enthusiastic stars for this sweet, beautiful, heartwarming story. It’s charming, and funny, and big-hearted, and touching, and imparts a lovely (and timely) message without it being saccharine or manipulative. I loved every page. Wishtree is like an iceberg- small on the surface but immensely powerful underneath. This is another quietly powerful book by adored author Katherine Applegate. Katherine Applegate’s The One and Only Ivan is one of the finest books I’ve ever read. Not one of the finest children’s book. Not one of the finest illustrated book — although the drawings are breathtaking. No, one of the finest books, period. I have harangued countless adults to please, please give Ivan a chance! So it pains me to say that Wishtree is no The One and Only Ivan. Yes, as is in Applegate’s 2013 Newbery Medal winner, Wishtree has an important message: We should accept people even if Katherine Applegate’s The One and Only Ivan is one of the finest books I’ve ever read. Not one of the finest children’s book. Not one of the finest illustrated book — although the drawings are breathtaking. No, one of the finest books, period. I have harangued countless adults to please, please give Ivan a chance! So it pains me to say that Wishtree is no The One and Only Ivan. Yes, as is in Applegate’s 2013 Newbery Medal winner, Wishtree has an important message: We should accept people even if they’re different and get to know them before we judge them. But whereas a gorilla as narrator worked so perfectly in The One and Only Ivan, Red the oak tree as narrator seems twee. And who is the audience for this book? The message, as portrayed in the book, is probably too subtly expressed for most 8- to 9-year-olds to follow but too heavy-handed for adults, even kid-lit lovers like myself. Beautiful story about family and community. Beautiful, unique, touching. But most of all, real . It's just what I needed to read today, this week, this year. Rereading and loving Red's voice. Wise and gentle. When bad things happen, he's learned you have to "stand tall and reach deep"
Delightful! I love that our protagonist is a tree and we see the world through the eyes of this still giant. I loved Katherine's descriptions of leaves and branches moving in the wind and the interplay of animals. Trees, our planets memories. They are also the planets lungs. They help to cool us down and bring beauty to us. So yes, I love the tree at the center of the story. The tree watches the lives of those around it, animals and humans. We meet many of the animals. The story really revolves Delightful! I love that our protagonist is a tree and we see the world through the eyes of this still giant. I loved Katherine's descriptions of leaves and branches moving in the wind and the interplay of animals. Trees, our planets memories. They are also the planets lungs. They help to cool us down and bring beauty to us. So yes, I love the tree at the center of the story. The tree watches the lives of those around it, animals and humans. We meet many of the animals. The story really revolves around Samar, a girl who is a muslim who moves into this neighborhood. Now this neighborhood is a collection of many different types of people and races and skins. It has been very opening but for reasons of the political mood of the country, the muslims aren't popular in this place. Someone carves the word 'LEAVE' into the tree and the family feels a little nervous and afraid. Samar makes a wish on this special wishing tree that she wants a friend. She is very lonely. So the tree who normally just holds the wishes begins to make plans using the animals to get Samar to interact with other people. 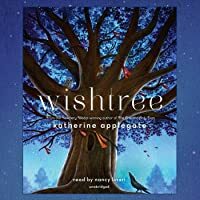 Wishtree by Katherine Applegate is a great story. It reminded me of the old sayings 'If walls could talk' and ' I'd like to be a fly on their ceiling'. I won't write a synopsis because there is already one on the book and there is always plenty of reviews with summaries available. I'll just jump right to what the writing style is like. This story is very well written. There are interesting facts sprinkled within the text but it doesn't read like a educational book. The facts are stated in a mann Wishtree by Katherine Applegate is a great story. This story is very well written. There are interesting facts sprinkled within the text but it doesn't read like a educational book. The facts are stated in a manner that it seems like the author is explaining part of the story to the reader. This technique is also used for some words that might be difficult for young readers. If all my children's school books were written like this I'd have a much easier time getting them to do their homework. The story was very easy for me to read. I can easily see any of my older children reading this story, and loving it. My younger child is just 8 months old, not reading yet, but I will definitely put this book somewhere special, and read it to her when she gets a little older. (It's to good to take the chance that she might rip the pages now.) My older children are 10,12,and 14. Girl, boy, girl, and I believe they would all love the story. This is a story for all ages. This is a story about how to be human, even if it's narrated by a tree who's more human than some people walking this earth. Red is a 216 years old oak tree, Red is also a wish tree. Every year on the 1st of May, people come to hang their wishes on her branches. When Samar and her muslim family move in Red's neighbourhood, some people aren't pleased and they make the new comers know they aren't welcome. But Red and her inhabitants aren't willing to let that pass without a fight. Friendship, humanit This is a story about how to be human, even if it's narrated by a tree who's more human than some people walking this earth. This book needs to be read by every child, every where. I almost missed out on this beautiful book. My stack of library books had grown a bit out of control and when I say “a bit” I mean like taking over the living room. Soooo... I *sighed*, bowed my head in defeat, and accepted that many of the books had to go back unread. BUT at the last minute I snagged this little gem off the top of the “return” pile to read. And I am so happy I did! A giant wishtree named Red guides us through this sweet story. Every year in May, people come from all over to whisper and tie their wishes, hopes, and dreams to Red’s limbs. Little rags, ribbons, and slips of paper cover Red’s trunk and branches with wishes of all kinds. From sad to silly! This beautiful, kind hearted, optimistic, “buttinsky” of a wishtree has lived in the neighborhood for a long time. 216 tree rings worth of time and wishes! You could say Red has deep roots in the community. Hehe…*cough* Sorry—that was just as bad as Red’s sense of humor. But this year could be Red’s last! So Red along with a few furry friends set out to make sure one little girl’s wish comes true. I hope you take the time to visit with Wishtree. Your heart will love you for it. En verdad estoy anonadado, Esta mujer lo volvió a hacer. De mis mejores lecturas de este año. ¿Para qué leer el árbol de los deseos? 1. Por la intensidad de los personajes, al ser narrado por ROJO un árbol, esta escritora logra que te sientas parte de la naturaleza, en verdad te sientes un árbol. 2. Te explica perfectamente el poder de la amistad, la fuerza de la unidad y la verdadera magia de la familia. 3. Maneja muy bien la fuerza dolorosa de la palabra FUERA Y QUEDATE. 4. Maneja de forma poét En verdad estoy anonadado, Esta mujer lo volvió a hacer. De mis mejores lecturas de este año. 4. Maneja de forma poética el tema de la discriminación, el racismo, las familias diferentes. Pero sobre todo el elemento de lo deseos y como estos pueden cambiar la concepción de la vida de las personas y su significado de la vida. 5. Lo más importante, esta novela te enseña el lema, NO PIERDAS LA ESPERANZA. As a former school librarian i must say that this book should be shared in every classroom throughout this country of ours. Applegate has created a a true gem with a special message that needs to be heard. This is such a fun read for primary school kids - perhaps 10 to 12 years old? For an older reader it might be too obvious a preachy, a moral lesson in tolerance, too obviously so. I nevertheless loved the humor and positive vibe in the book, especially if you want to learn from a young age how to become a political activist. I am a serious tree hugger myself, so this book was spot on. Before I get into this very long review, I do want to state that I didn't hate the book. It's very nice, and I think would be a decent read aloud. But I keep seeing it bandied about as a possible Newbery contender, for many people the top choice, and that brings out the hyper critical in me. I found this book to be insufferably twee. It also grated on my nerves that every single non-human character was highly anthropomorphized, but were supposedly living in the real world. I'm perfectly happy to Before I get into this very long review, I do want to state that I didn't hate the book. It's very nice, and I think would be a decent read aloud. But I keep seeing it bandied about as a possible Newbery contender, for many people the top choice, and that brings out the hyper critical in me. The book couldn't quite decide if it was a fantasy with twee talking animals or a realistic fiction book with a dash of imagination to allow us to understand what the animals were thinking (the way that, say, One and Only Ivan, did.) It was a tone problem throughout. The naming practices of the animals is cute, but bothered me on other levels as well. I didn't like the sort of condescending tone that Red uses when talking about how the other animals name themselves. It wasn't something I could put my finger on, but there was just a sense that we were supposed to be amused by the ridiculousness of it. I suspect that it's one of those things that had I been really into the book I would have seen as fond amusement instead of mocking, but it's still amusement. Names have power. Naming culture varies widely around the world and we should respect that rather than being amused by it. Also, the owls who give themselves "sensible no fuss names" are Harold and Agnes. Which signals that very WASPy names are "sensible." I also found the writing choppy, as if it wanted to be free verse, but couldn't quite bring itself to go all the way. Wishtree is the sort of book that is a lovely easy read, with memorable characters and a great plot, that you think about once you’ve finished it. I find myself mulling over it continuously , grateful to have read it. It is filled with wonderful lines (“It is a great gift indeed to love who you are”) and wonderful worldly wisdom, dispensed by Red, a tree with over 200 rings, a tree who is home to many critters, a tree who cares. Lovely story about a tree that watches over a neighborhood, and holds the wishes of the community in her branches. But when a very special child makes a wish, the tree decides to actually reach out and make that wish happen. Charming and timely. Short. Sweet. And oh, so important. This is a quick inspirational piece from a different perspective. The way that Katherine Applegate captures nature is incredible. This review has been hidden because it contains spoilers. To view it, click here. Now while I and indeed do very much appreciate the important and necessary messages of inclusivity presented in Katherine Applegate's Wishtreee and very much agree that fighting against ethnic and cultural bigotry is important, I also and nevertheless cannot say that I have personally all that much enjoyed Wishtree as a reading experience in and of itself. For one, although the admonishments against ethnic stereotyping and cultural anger as well as the strong coming together of especially the ne Now while I and indeed do very much appreciate the important and necessary messages of inclusivity presented in Katherine Applegate's Wishtreee and very much agree that fighting against ethnic and cultural bigotry is important, I also and nevertheless cannot say that I have personally all that much enjoyed Wishtree as a reading experience in and of itself. For one, although the admonishments against ethnic stereotyping and cultural anger as well as the strong coming together of especially the neighbourhood children to change Samar's parents' minds regarding moving after there had been some rather nasty instances of anti-Muslim hatred against the family (including a vile racist bully boy carving "leave" into the bark of the local Wishtree), while this definitely should be in every way considered very much necessary and positive, Katherine Applegate's textual execution has (to and for me) also felt rather annoyingly unnuanced and often like I am being squarely hit over the head with a proverbial rubber mallet, almost like having to endure a moralistic church sermon (not to mention that the scenario of Red the Wishtree being saved from the axe first and foremost by the neighbourhood wild animal babies basically organising themselves and literally having a sit-in or more to the point a climb-in on Red's branches has also seemed a bit too overly fantastic and artificial for a story that at least in my opinion looks based on a real-life and not a fantastical premise). And for two, and this is definitely mostly an entirely personal quibble, while I do love and adore trees, I really only enjoy reading about anthropomorphic, human-like, talking trees such as how Red the oak tree acts and reacts in Wishtree if I am perusing either fairytales or fantasies. And since it is pretty obvious that Katherine Applegate has at least in its core envisioned her Wishtree as realistic fiction dealing with primarily modern 21st century American issues and scenarios (mostly regarding nastiness against recent immigrants and that it is often considered much easier and less of a hassle for homeowners to get large trees removed, to have them cut down), I really have neither much liked nor even appreciated that the main narrator and protagonist of Wishtree is an oak tree which almost continuously chatters away and thus indeed often rather thinks and behaves like a human being would (for trees are trees and humans are humans and truly, in realistic fiction, they should at least in my opinion be separate and not too similar, as I also tend to think that we do trees as living beings a grave disservice anthropomorphising them and making them seem as too much like us). Vážně potřebujete další důvod, proč si to přečíst? Je to skvělý! Dozvíte se třeba to, podle čeho si vybírají jména mývalí a skunkové a stromy (kromě jedné palmy rebelky v Kalifornii - a tam je možné všechno) a taky to, že stromy ve skutečnosti mluví. A taky že kvůli nim můžete brečet. Krásný ❤ - Smrdíš jako skunk! Right story at the right time. Pair with COME WITH ME. You need to read books for children. I think that because sometimes profundity and really how to live life is simply told in all the chaos of adult literature, only in children’s books. Whether it is, “The Giving Tree” or it is lessons learned from, “Charlotte’s Web”, books written for children are in fact meant for adults, because we need to learn how to be empathetic and compassionate, so we can pass it to kids. “Wishtree” is the third book I read by Katherine Applegate and as usual I finished You need to read books for children. I think that because sometimes profundity and really how to live life is simply told in all the chaos of adult literature, only in children’s books. Whether it is, “The Giving Tree” or it is lessons learned from, “Charlotte’s Web”, books written for children are in fact meant for adults, because we need to learn how to be empathetic and compassionate, so we can pass it to kids. “Wishtree” is the third book I read by Katherine Applegate and as usual I finished it with a lump in my throat and a smile on my face. The book is narrated by Red – a wise old tree. He is obviously cool, steady, and calm. He is a couple of hundred years old and is home to many birds and animals, all of whom communicate. Applegate’s writing then just doesn’t become about the Wishtree Red, but about the entire neighbourhood, people related to the tree, the ones who want to cut it down (not a spoiler really) and the ones who want to save it. At the heart of the book though, is a story of racism, acceptance and finding one’s roots and calling it home. I am not going to speak about the plot all that much but I will tell you that sometimes, simple books such as these end up being so layered and impactful that you are stunned by its seemingly simplicity. “Wishtree” simply put is a story of a Red Oak Wishtree who watches over the neighbourhood and thinks he has seen it all, till a new family moves in and not everyone is welcoming to them. Gift this book to children. Make them understand the need for empathy and kindness, needed more than ever in the world we live. Let them know that you care that they care. Applegate’s books are all about empathy and work beautifully. Read it. Wishtree is the story of Red, an optimistic oak tree who is home to many wild creatures living in harmony in her branches and hollows. Every year, the residents who live nearby come to tie their wishes onto Red's branches in hopes that they will come true. One wish in particular comes from Samar, a young Muslim girl whose family is the target of a hateful act from one of their neighbors. Samar wishes for a friend, and Red, being the optimist she is, wants to do everything she can to grant this l Wishtree is the story of Red, an optimistic oak tree who is home to many wild creatures living in harmony in her branches and hollows. Every year, the residents who live nearby come to tie their wishes onto Red's branches in hopes that they will come true. One wish in particular comes from Samar, a young Muslim girl whose family is the target of a hateful act from one of their neighbors. Samar wishes for a friend, and Red, being the optimist she is, wants to do everything she can to grant this little girl's wish. Wishtree is a poignant, cleverly written tale that will have readers laughing out loud and crying tears of heartache and joy. A very timely message for readers of all ages! Katherine Applegate is the author of The One and Only Ivan, winner of the 2013 Newbery Medal. 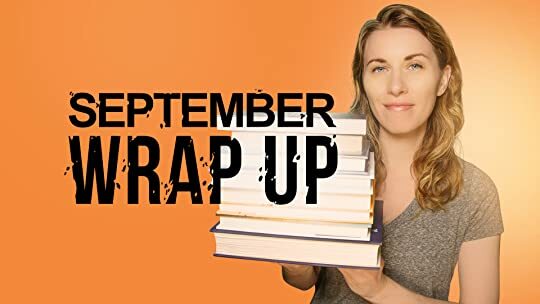 Her novel Crenshaw spent over twenty weeks on the New York Times children's bestseller list, and her first middle-grade stand-alone novel, the award-winning Home of the Brave, continues to be included on state reading lists, summer reading lists, and class reading lists. Katherine has written three picture Katherine Applegate is the author of The One and Only Ivan, winner of the 2013 Newbery Medal. Her novel Crenshaw spent over twenty weeks on the New York Times children's bestseller list, and her first middle-grade stand-alone novel, the award-winning Home of the Brave, continues to be included on state reading lists, summer reading lists, and class reading lists. Katherine has written three picture books: The Buffalo Storm; The Remarkable True Story of Ivan, the Shopping Mall Gorilla (often used as a companion book to The One and Only Ivan for younger readers); and Sometimes You Fly (publishing in spring, 2018). For beginning readers, Katherine wrote Roscoe Riley Rules, a seven-book series. With her husband, Michael Grant, Katherine co-wrote Animorphs, a long-running series that has sold over 35 million books worldwide.